Discover why Amsterdam in The Netherlands ranked #24 in our countdown of ‘100 Most Incredible Cities in the World’. The Venice of the North is lined with canals that wind their way through streets of quaint old merchants’ houses, while its galleries are world-renowned, featuring the finest works from Dutch masters Rembrandt and Van Gogh. What better way to get a feel for a city than a flea market; a place where locals come to sell all their unusual bits and bobs, unwanted or otherwise. Open Monday to Saturday, the 300-plus stores of the Waterlooplein Flea Market are where to find treasures like classic cameras, old leather bicycle seats, vintage clothes, silverware and period biscuit tins. While there’s the famous flower market and any number of farmer’s markets to peruse, Waterlooplein is well worth swinging by to find that strange something from the annals of Europe’s past you never knew you needed. 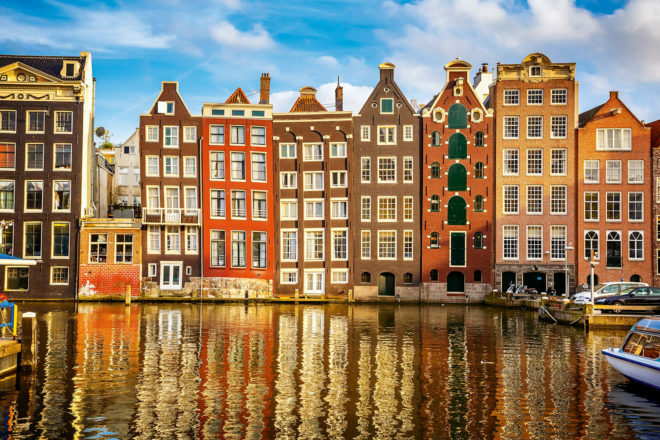 KLM Royal Dutch Airlines flies to Amsterdam from major Australian cities daily via its partner airlines through Asian and Middle Eastern gateways. Travelling in World Business Class on its Boeing 787 Dreamliner, you can expect direct aisle access, wifi onboard and an exclusive KLM miniature Delft Blue house. Check out klm.com.au for the lowest fares.